Okay, my daughter wanted something different for Valentines, so...Ta-da! Here are shaker boxes. They will be put into tiny baggies, so no mess for our poor teacher. The backs say You "shake" me up Valentine! and the usual To/From. Yea, so 25 of those later and I still have two more kids to go. Boxes were cut from Cricut's Tags, Bags, Boxes & More. The lips stamp is from Michael's $1 rubber stamps and embossed with Red Tinsel embossing powder. I used the films that the acrylic $1 stamps come in to make the window. The things inside are tinsel glitter, tiny heart confetti, and XXOO confetti. The boys are much easier...my first grader is using smiley stamps and mini notepads in baggies with a tag that says "Valentine, You make me smile!" My preschooler is giving mini Crayola coloring books and crayons in baggies that say "You Color My World!" Cheesy, I know, but what Valentine's card isn't??? 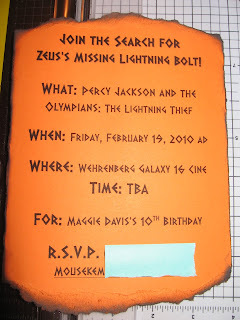 My daughter and I have been reading the Percy Jackson series and she is so excited for the movie. It comes out the week before her birthday, so that is what we are doing for the party. She is taking a group of friends to see it on her birthday because they have no school that day. Here are the invitations. I used Stampin' Up Pumpkin Pie card stock and got the font from dafont.com. This font is called Dalek. I also got Ancient Greek font for the person's names. I tore the top and bottom edges, then roughed up the sides with my finger nail. I then inked all the way around with Cat's Eye chalks in Chestnut and Charcoal.